Strobilanthes is a beloved house plant that has found its way to the garden. The foliage is breathtaking with its multitude of colours – variegated dark green, purplish-pink on top and all purple underneath. The silvery-metallic foliage shimmers with iridescence. It is a challenge to find a colour that Strobilanthes does not flatter, but it looks best with pinks, blues, and purples. The delicate flowers are funnel-shaped, pale violet, and arranged on short spikes. 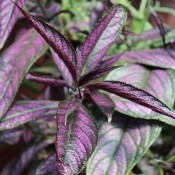 Strobilanthes has a tendency to look washed out if grown in a shady location; full sun yields the most vivid colours. 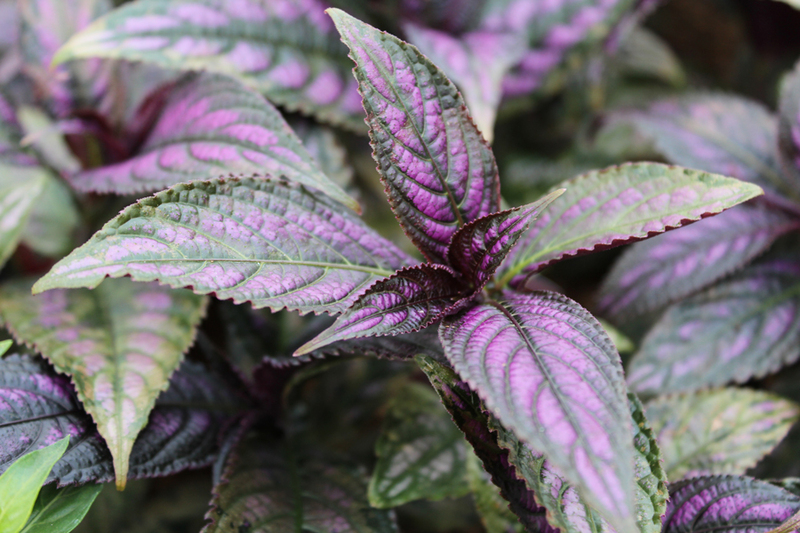 Purple Passion is an outstanding tropical looking plant with rich purple foliage with dark green edge and metallic sheen. It is an excellent colour, structure and texture plant. Purple Passion looks best with pinks, blues, purples and silvers. For a breathtaking combination, plant with any chartreuse-coloured foliaged plant. Ideal for combination planters and big containers.